A vibro screen or a pharmaceutical powders vibro sifter is an essential part of every pharmaceutical production process as it eliminates all oversized contamination and offers quality assurance of the finished product. 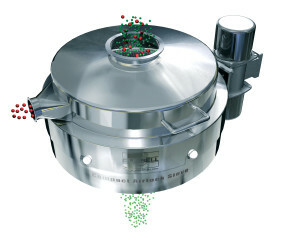 However, since active pharmaceutical powders can severely affect the health and safety of operators, enclosed vibro sifters which provide a dust tight seal during screening is a must. By using a patented twist lock inflate (TLI) pneumatic clamping system the Russell Compact Airlock Sieve™ provides a uniform dust tight seal eliminating the exposure of harmful dust to the operator whilst also being OEL level 5 compliant. 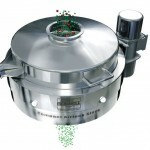 As this is an extremely sensitive industry where a product recall would undoubtedly damage a company’s reputation, the design of this vibro sifter has been undertaken in accordance with Current Good Manufacturing Practices (cGMP). Based on clean lines to make cleaning easier all contact parts can be supplied crevice free and are manufactured in 316L grade stainless steel, making them fully washable. Dis-assembly is also quick and easy and can be undertaken without tools further enhancing ease of cleaning. Contact Russell Finex the pharma vibro sifter manufacturer in India or find more information about all Russell Finex vibro screens and vibro sifters. "During initial product trials, we recognized how the new Airlock screener utilizes the Russell Compact technology to increase screening efficiency allowing even sticky products to be sieved without blinding."